Twitter is wonderful. Really it is. 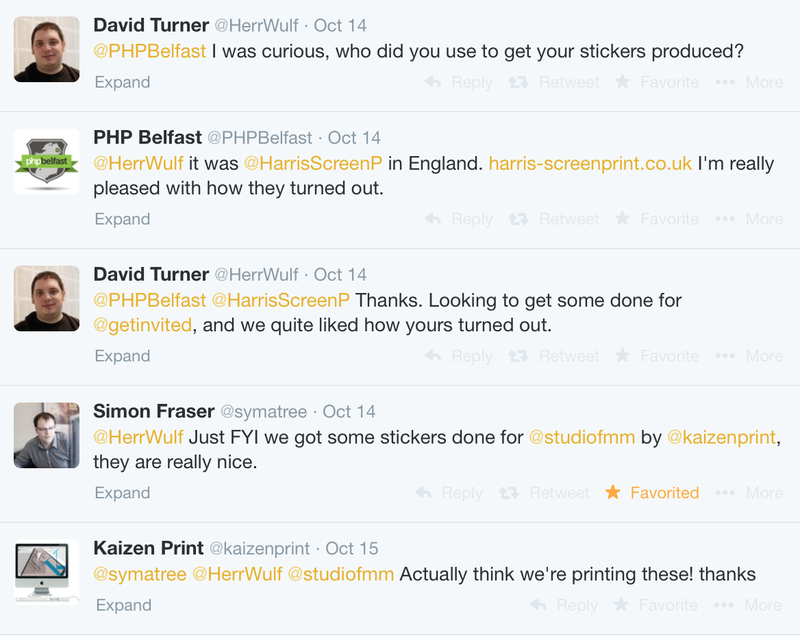 Last week, a completely unknown business to us, put a shout out asking for information on where to buy stickers. One of our current customers Simon from Fresh Made Media (@studiofmm) chimed in to recommend Kaizen for such a job. Turns out weâ€™d already been speaking to the Get Invited team and were printing some absolutely amazing custom cut stickers. But Twitter still rocks! 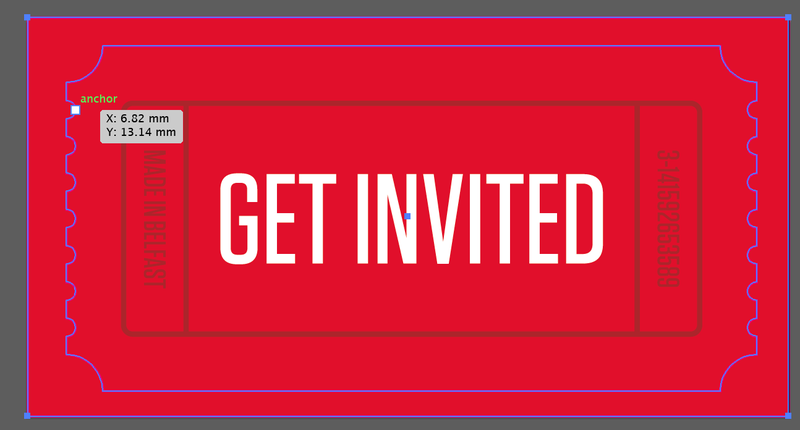 The Get Invited branding is extremely strong and features and old movie ticket styled logo. We love it. The stickers were to represent the design exactly and so straight sticker printing probably wouldn't be the best option. Weâ€™ve decided to custom cut our printed stickers using our Roland 540 SP which not only prints at photographic quality, but also plots the stickers to within a single millimetre of the plot line. Most people don't realise what goes into a potted sticker, so we have shown above, how the artwork looks when we start printing and plotting (known as print and plot within the print trade). 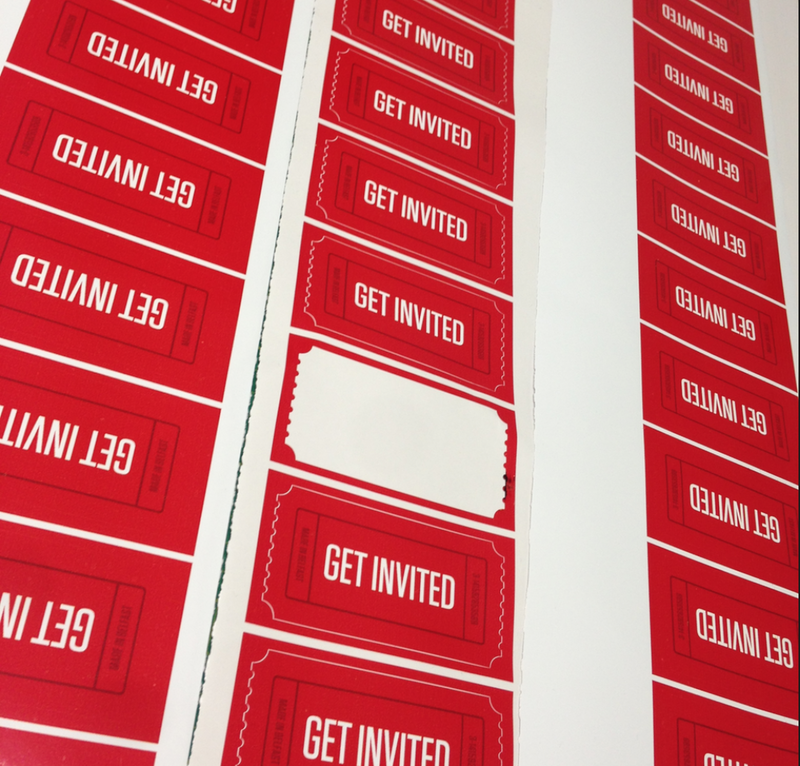 The final result looks outstanding and an exact replication of the Get Invited logo was created in sticker format. All our stickers are printed using big quality 3 year outdoor vinyl and the latest in outdoor inks. The stickers should indeed stand the test of time and more importantly our Belfast weather, if they are used outside. What does Get Invited do? Quite simply, Get Invited lets you sell tickets, manage, and promote your event online. Weâ€™ve been fortunate enough to see the web app in action and it works like a dream. They have a two tier pricing system. Free for Free events (AWESOME) and 2% transaction fee, plus 50p per customer for paid for events. This simple pricing structure will appeal to many businesses, charities and event planners across the world. We love working with local businesses to help develop and grown their marketing across Belfast, Ireland and around the world. Even through something as small as sticker printing, we are helping a local business with huge worldwide potential to achieve their marketing goals. 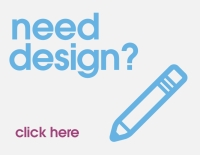 Remember, even online businesses need offline marketing!